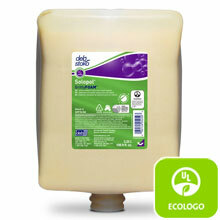 Deb's Gritty Foam hand soap is a transformed heavy-duty hand soap. Gritty foam is a foaming heavy duty hand cleanser with suspended bio-scrubbers. As the heavy duty foaming hand soap passes through the dispenser pump it is infused with air delivering up to five times more volume than the liquid foam.